Home » Original Article » Synchronous abdominal tumors: is combined laparoscopic surgery in a single approach a safe option? Synchronous abdominal tumors: is combined laparoscopic surgery in a single approach a safe option? Background and Purpose: Recent advances in cancer treatment have resulted in bet­ter prognosis with impact on patient’s survival, allowing an increase in incidence of a second primary neoplasm. The development of minimally invasive surgery has provided similar outcomes in comparison to open surgery with potentially less mor­bidity. Consequently, this technique has been used as a safe option to simultaneously treat synchronous abdominal malignancies during a single operating room visit. 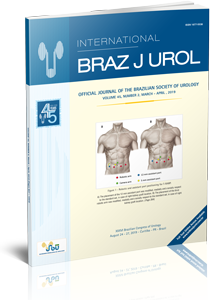 The objective of this study is to describe the experience of two tertiary cancer hospitals in Brazil, in the minimally invasive treatment of synchronous abdominal neoplasms and to evaluate its feasibility and peri-operative results. 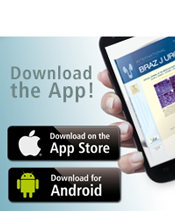 Materials and Methods: We retrospectively reviewed the data from patients who were submitted to combined laparoscopic procedures performed in two tertiary hospitals in Brazil from May 2009 to February 2015. Results: A total of 12 patients (9 males and 3 females) with a mean age of 58.83 years (range: 33 to 76 years) underwent combined laparoscopic surgeries for the treatment of at least one urological disease. The total average duration of surgery was 339.8 minutes (range: 210 to 480 min). The average amount of intraoperative bleeding was 276.6mL (range: 70 to 550mL) and length of hospitalization was 5.08 days (range: 3 to 10 days). Two patients suffered minor complications regarding Clavien system during the immediate postoperative period. Conclusions: Combined laparoscopic surgery for the treatment of synchronous tumors is feasible, viable and safe. In our study, there was a low risk of postoperative morbidity.